It's been a while since I last climbed up a peak. My first climb was at Osmena Peak last April 2017. Mt. Kan-Irag (or more famously known as Sirao Peak) was my second where we trekked for 11 hours. This was just last July 2017. And my third climb for this year is Danasan Peak which just happened last Sunday, November 5. Going up there is easy and will only take around 15-20 minutes depending on your pace. Going up there was an experience I could never forget. And that's because for the very first time, I finally got to witness, what the people call, the "sea of clouds". Climbing Danasan Peak was our first activity on our second day at Danasan Eco Adventure Park (I will be blogging about our first day on my next post). Our call time was at 5AM. I woke up to my alarm at 4:20AM. I woke Sheen up so we can get ready and be at the meeting place on time. We left when we were already complete. On our way up there, it drizzled but thankfully, it stopped after just a few minutes. We continued walking and then we saw the rainbow ever so beautiful. 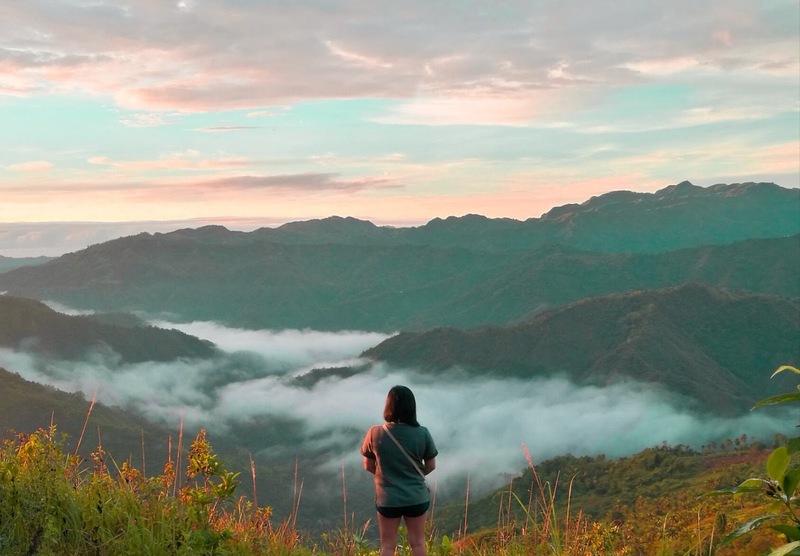 After around five minutes of hiking, we finally reached the peak and saw the breathtaking view of the mountains and the sunrise. Whenever I travel, I always try my best to wake up early to catch the sunrise. Most of the time, I'm in the wrong side though. The sun rises in the east and the sun sets in the west. Remember that science lesson? Yeah, I'm dumb at that. I can only count the number of times I have witnessed the sun rise with my fingers. For now. And the sunrise at Danasan Peak was definitely one of the most beautiful I have ever seen. And the best part about our quick hike to Danasan Peak? The sea of clouds. We were busy taking photos of the sunrise when our friends from Danasan Eco Adventure Park made us come to the spot to see the sea of clouds. I was honestly astounded by the view I saw. It was breathtaking that I thought to myself, "So this is how it is. This is how it feels like to witness the famous sea of clouds." Opportunities like these were brought by passion, patience, hard work, and continued support from you my dear readers. 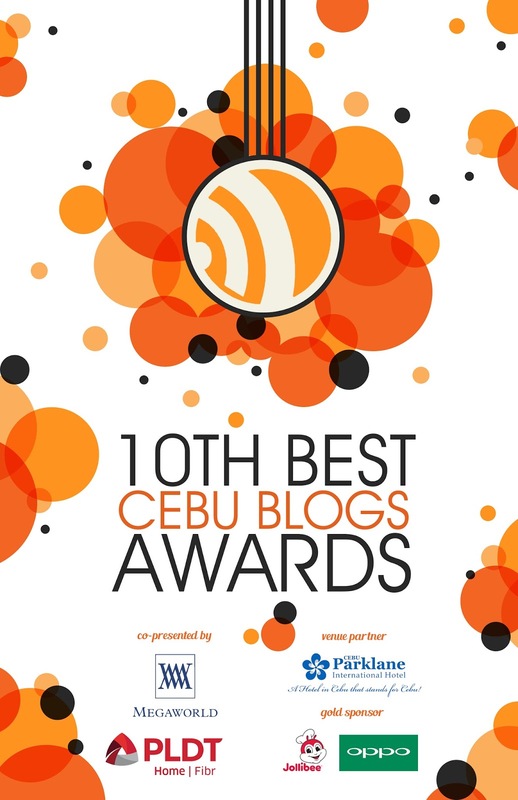 When I received the email that I got nominated as one the finalists for Best Cebu Travel Blog for the second time, I was in all honesty, surprised. There have been a lot of Cebu travel bloggers coming out already that I never thought I could still be counted in. Who would have thought? That a mere blogger like me who aspires to be a known travel blogger when I don't even travel regularly and haven't been able to go to places that most travel bloggers have already been would get nominated. This year had been full of opportunities that brought me and my blog to places. And I will always and forever be grateful to my family, friends, readers, followers who continue to support me and to the brands and PRs who trusted me and gave me opportunities I never thought I could have. This nomination is for you, win or lose! Cheers to more wandering escapades! Nindot kaayo Ate noh? Nindot ibalik didto jud ay! Puhon puhon!!! Wow! I'm out of words. It's ugh! Beautiful ate Jan! I'm not a morning person but this is so worth it. Mo mata jud kog sayo makakita lang ani na sunrise. Oh gahd, I want to see this "sea of clouds" when I get back to Manila! It looks really beautiful and breathtaking especially in your extraordinary photos. Great post! Love your photos especially the first one. :) Di pa ako nakatry mag-hike. Sana I can do it before the year ends. THanks Elaine! Yes yes you should try it before 2017 ends! Magandang experience talaga sya! Hi Ella, I'll also be returning to Cebu next month to spend a week there and I was wondering how you managed to arrange a trek to Danasan Peak with Danasan Eco Park staff? Naa silay included package daan, or kailangan ka mo specially hangyo nila?